Fluance SXBPW High Definition Bipolar Surround Sound Wide Dispersion Speakers for Home Theater by Fluance at The Met Theatre. MPN: SXBPW. Hurry! Limited time offer. Offer valid only while supplies last. A true feeling of immersion. The Fluance SXBP Bipolar Surround Sound Speakers help create encapsulating cinema quality experiences in your home. A true feeling of immersion. The Fluance SXBP Bipolar Surround Sound Speakers help create encapsulating cinema quality experiences in your home. Combining Fluance performance with a unique omni-directional driver design, the SXBP will change the way you experience home movies today. The SXBP is engineered with only premium components that will successfully recreate a movie's sound effects as they were meant to be heard. The unique bipole configuration of the SXBP creates a large three dimensional soundstage. This is achieved with two complete sets of drivers on opposing sides of the cabinet. The results are widespread, enveloping surround sound throughout your entire room. You will hear everything in great detail no matter where you sit. 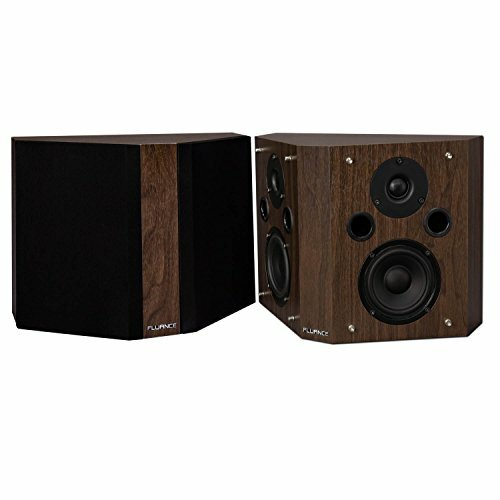 Say goodbye to "dead spots", an ideal mix of direct and indirect sound and a unique surround ambiance only a bipolar speaker can create. The SXBP are designed for placement beside or behind the listeners for a room filling home theater experience. The SXBP delivers amazingly convincing surround imaging like you would expect in a movie theater.From the dual high performance drivers, to the dual premium silk dome tweeters, these speakers will execute a more accurate, powerful, and natural sound. Whether watching movies or the big game, the SXBP bipolar speakers will ensure you are in the middle of the action. So grab some popcorn, sit back, and enjoy. Fluance has successfully revolutionized home theater audio today. Utilizing only superior components and expert audio engineering, the SXBP is another testament to the performance that can be achieved when a passion for audio takes center stage. The SXBP uses audio grade MDF wood for a warmer more natural sound. You'll be enjoying cinematic audio in your home for years to come. Dual ultra high-end Neodymium balanced silk dome tweeters provide accurate high frequency response; Dual 4 inch polymer treated drivers with butyl rubber surrounds ensure serious performance. If you have any questions about this product by Fluance, contact us by completing and submitting the form below. If you are looking for a specif part number, please include it with your message.